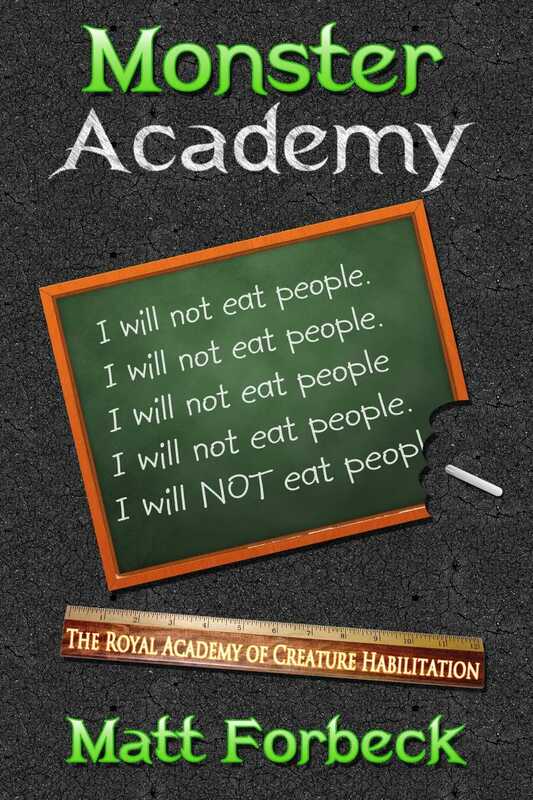 I Will Not Eat People is a novel that focuses on a young orphan boy named Ruddy who is apprehended by the King’s men and brought to the Royal Academy of Creature Habilitation. In the world that Matt has created, several years ago the King led a war on all the monsters, great and small, and wiped out the majority of them. Of the few that are left, unless they are killed, they are brought to the Royal Academy and are enrolled there as students. There is a very interesting reason for why the king gave up on killing monsters on sight, and that in turn informs a lot of the drama in the novel. Ruddy, who is a dragon in his monster form, has a really rough time in his first few days at the Academy since he is the new boy. He is bullied by some of the older students and eventually he gets caught in a murder investigation, involving no less a personage than the brother of the kingdom’s high priest, a monster-hunter of great renown. I Will Not Eat People explores that murder investigation angle, and it also explores the concept of prejudice and bias, and how these can be taken to unwholesome extremes by fanatics who refuse to listen to any sort of reason. Ruddy, and the supporting cast of characters are really fun all the way through. The master of the Royal Academy is one of the coolest of Matt’s characters that I’ve read to date, and someone I was really interested in seeing more of. Which, we will hopefully see in the next two novels. It would be a nice subplot to have I think. One of the great things about Matt’s novels is the dialogue. His characters are often sharp, witty individuals, and that holds true here as well. Ruddy, the master of the Academy Mr. Mortis and a certain female character are all great characters that have the hallmarks of characters I really enjoy reading about, and that Matt is really good at writing. This is a novel that works on almost every level for me. If there is any criticism that I have for this novel, it is that the opening is a bit clunky. The writing grabbed me immediately but the first few pages are a bit of a chore to read. Nothing major, but does leave an impression. And the climax is quite fast-paced. I would have liked to spend some more time with teasing out the reveal of who the murderer is, and focus more on the investigation is. Being such a short novel, roughly 50,000 words, there isn’t a whole lot of room to go in depth here, and the way that the story is told, things flash by a little too fast. That’s really it though. I think that with this novel Matt Forbeck has another win on his hand. I wasn’t really sure what to expect from it, exactly, but I can say that it was a hell of a lot of fun. This is a great young adult book, of the sort that I’d have loved to read as a kid. So that’s that. I hope you get a chance to read this book and enjoy it as much as I have. Posted on February 4, 2014, in Book Reviews, Review Central and tagged 12-for-12, 2014 Release, Book, Book Review, Dragons, Fantasy, Goblins, High Fantasy, I Will Not Eat People, Matt Forbeck, Monster Academy, Review, Review Central, Self-published, Trolls. Bookmark the permalink. 1 Comment.